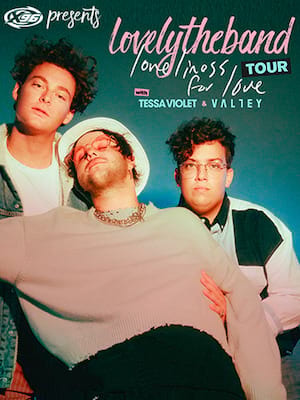 Indie-pop-rockers lovelytheband hit the road in 2019 with their Finding It Hard To Smile tour! The Californian trio head out across North America in support of their debut album Finding It Hard To Smile. After bursting onto the charts in 2017 with their hit single "Broken" lovelytheband have been busy proving that they are no "one hit wonder". 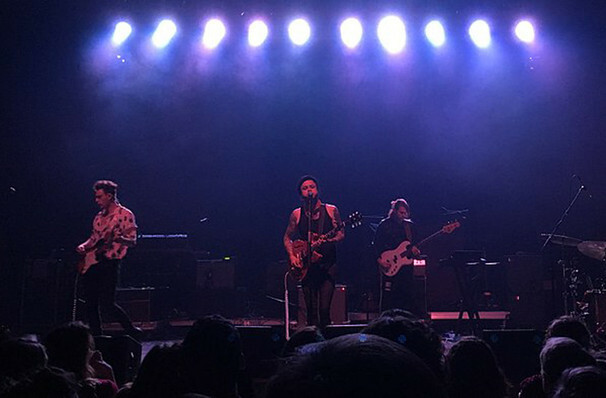 With their self released "Broken" becoming one of the longest-running number one tracks on Alternative Radio in 2018, lovelytheband members Mitchy Collins, Jordan Greenwald and Sam Price were catapulted into superstardom. With anticipation mounting the trio released their follow-up "These Are My Friends" in 2018, continuing to reign supreme with their infectious indie-pop sound and catchy melodies. With their honest lyrics, the band breach the void and talk openly about suffering from anxiety and depression, allowing them to have cultivated an ever-growing and loyal fan base. Don't miss your chance to see lovelytheband live on tour! Seen lovelytheband? Loved it? Hated it? Help your fellow Peoria Theater visitors by leaving the first review! Sound good to you? Share this page on social media and let your friends know about lovelytheband at Monarch Music Hall. Please note: The term Monarch Music Hall and/or lovelytheband as well as all associated graphics, logos, and/or other trademarks, tradenames or copyrights are the property of the Monarch Music Hall and/or lovelytheband and are used herein for factual descriptive purposes only. We are in no way associated with or authorized by the Monarch Music Hall and/or lovelytheband and neither that entity nor any of its affiliates have licensed or endorsed us to sell tickets, goods and or services in conjunction with their events.